I know I’ve given a recipe here for spiced turmeric milk already, but this being Veganuary and all that, I thought I’d give you my vegan version. Plus I’ve learnt a thing or two about the super spice since writing that post. Golden turmeric latte is not only a healthful drink, it’s also quite delicious. Turmeric is not the most obvious ingredient for a drink, but it’s becoming increasingly popular. Even in our quiet country town, our local cafe, Olive & Co, does a mean turmeric latte. It’s become my favourite drink to order there. Of all the common spices we’re likely to have in our kitchens, turmeric is relatively mild in taste. It might take a while to get used to it if you’re unfamiliar with the flavour, but I took to it straight away. 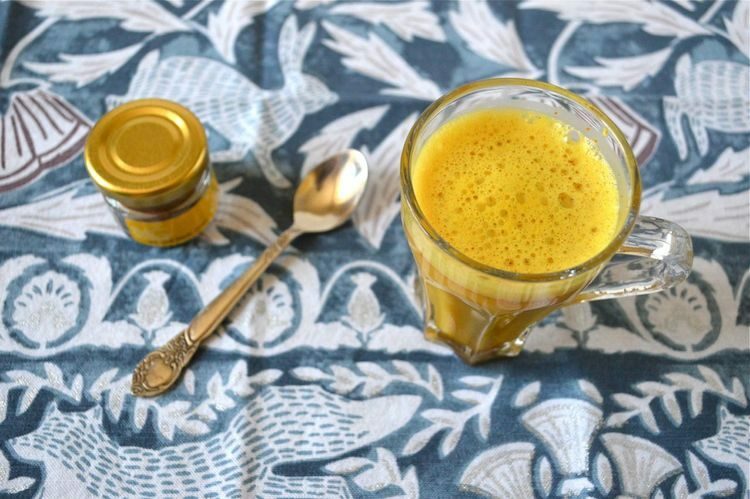 I make a cup of golden turmeric latte two or three times a week, usually on days when I’ve not added turmeric to my morning smoothie or planning to include it in whatever I’m making for lunch or supper. The key to consuming turmeric, apparently, is to ensure you take it with some black pepper and fat. Turmeric (Curcuma longa) is a powerful antioxidant which is best known for its anti-inflammatory effects. It’s also antiseptic, anti-fungal and anti-bacterial and has been used as a medicine for thousands of years. Curcumin, which is the main active ingredient in turmeric is, however, difficult for the body to absorb. Piperine, found in black pepper, is said to enhance its bioavailability as does taking it with fat. I try to consume some of this golden spice most days as my joints are decidedly creaky. Since taking it on a near daily basis for the last six months or so, I have noticed a real difference. My joints are still a bit stiff, but the pain is significantly less. I’ve also got my mother onto it; she’s really noticed an improvement in her arthritis. Warm milky drinks have been popular for a long time and once you’ve added some sweetener, a bit of coconut oil and a sprinkle of cinnamon, this one is really very tasty. So, if you haven’t yet sipped on a golden turmeric latte, I urge you to go try a cup. It might just put a spring in your step. A healthful warm milky drink that is tastier than you might imagine. Warm the milk and coconut oil gently in a pan You want to get the milk hot, but make sure it doesn't boil, especially if using a non-dairy milk. When hot, whisk in the turmeric, pepper, cinnamon and maple syrup. Taste and add a little more maple syrup if you have a sweet tooth. Pour into two small cups or glasses and sip slowly. Want a reminder? Why not pin this golden turmeric latte for later? Thanks for visiting Tin and Thyme. If you make this golden turmeric latte, I’d love to hear about it in the comments below or via social media. Do share photos on social media too and use the hashtag #tinandthyme, so I can spot them. For more delicious and nutritious recipes, follow me on Twitter, Facebook, Instagram or Pinterest. Oooh delicious! I didn’t know turmeric would be more effective with pepper and fat so that’s very handy to know! I’m learning all the time. Luckily, I really like it with a bit of pepper. Turmeric is such a versatile spice. It has so many uses. It’s very good for healing bones . In our home, turmeric milk is recommended for coughs too. When we were kids we used to hate the taste but now it’s not too bad. Adding maple syrup sounds good. Ah that’s good to know, thank you. I know it’s uses are many. Looked like honey for a minute. This Turmeric Latte definitely looks like the best drink in the town. Great recipe I must say. Easy peasy and so good for us! I’ve never thought of adding it to a drink. I add it to curry, dal, burgers and soups, but never drinks. The spicing in this has persuaded me! Once you get your head around the idea, it’s really very nice. This does sound really good, what a lovely colour too. I really like turmeric in curries as it’s so fragrant so would love to give this a try. I love your recipe, I am definitely going to try this. I know turmeric is really good for you for different reasons but I am not the biggest fan of its flavour so I don’t use it very often, however now that I’ve come across this recipe I might start having it more often! It’s difficult to get away from the flavour, but there’s something about this combination that makes it a real pleasure – at least for me! I have SOOO much turmeric in my house! Fresh and normal powdered! I literally can never have enough! I put it in every meal I eat! Haha, I understand you completely. I stock up with fresh turmeric when I can find it, but it’s not always easy. I have been hearing so much buzz about turmeric drinks. I love the sound of this latte. I think I have everything in my kitchen to try it-sounds like the perfect things for this snowy afternoon! Did you try it Kate? Do let me know how you found it. I am so lame– I haven’t had golden milk yet! Time to change that– your version looks so good! Hahaha, it’s not for everyone Julie. Definitely worth trying once though. Such a beautiful colour and so good for you. Thanks Janice. It’s one of my favourite drinks, although I’ve rather got out of the habit this summer.